Learn to paint reflections in the water. This simple painting has been created for the painting class. 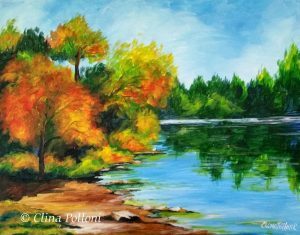 Painting Class Taught by Clina Polloni. The Shelley Lake is located in Raleigh, North Carolina, with wooded trails along a scenic lake. A perfect place to feel inspired to create plain air paintings and enjoy the outdoors in an autumn day. Start by drawing with a pencil, putting attention to the reflections of the trees in the water. Paint the sky, but at the same time paint the water, because the water is a reflection of the sky. Paint the trees in the background, and at the same time, copy the trees in the water in an opposite way. The water is like a mirror to the trees. Start painting the trunk and branches of the trees. Finish your painting by doing the leaves, dirt and bushes. Acrylics: There are many brands of acrylic paintings that I have tested but the one that I like the most is: SOHO, Urban Artistic Acrylic: Excellent paintings, sold at more reasonable price by Jerry’s Arterama. 3060 Wake Forest Road, Raleigh, NC 27609. (919) 876-6610. You can also buy the supply on line.